A little while ago I introduced My Micellar Cleansing Water Test which you can read all about here. Basically, over the course of 12 weeks I’ll be testing 12 budget (under £5) micellar cleansers. For the past week I have been using the B. 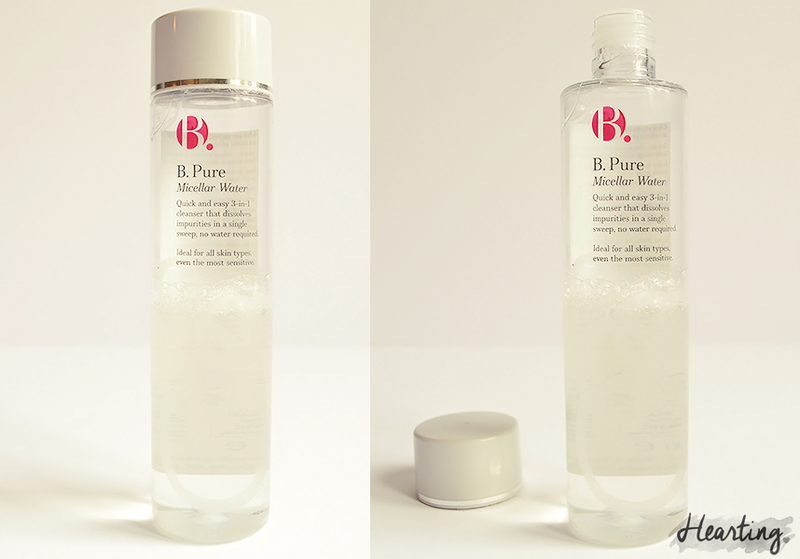 Pure Micellar Water morning and night to remove make up and dirt. I’m now ready to share my thoughts on this micellar cleanser. The B. Pure Micellar Water usually retails at £4.99 for 150ml of product, but at the time of purchase (and actually it’s still on offer now) it cost me £2.25 which is much more reasonable. This micellar cleanser is described as a “quick and easy 3-in-1 cleanser that dissolves impurities in a single sweep, no water required”. The B. 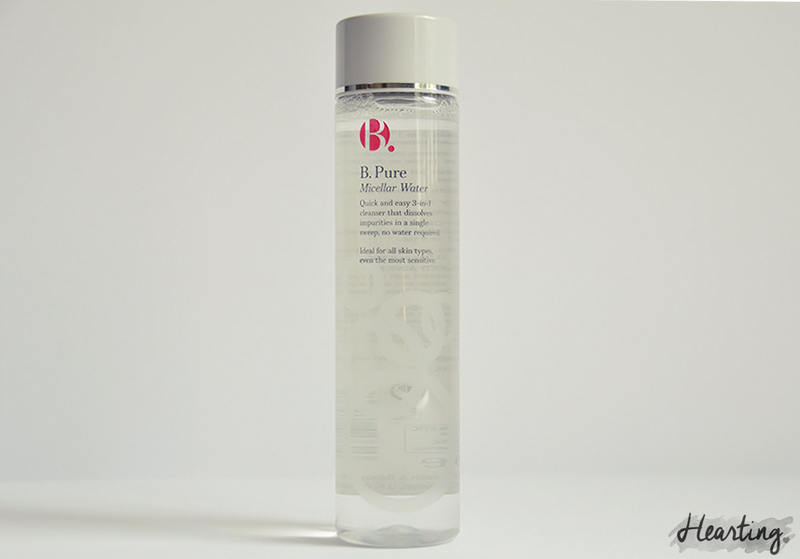 Pure Micellar Water is housed in a dinky clear plastic bottle with a pale grey screw top lid. As I’ve mentioned before, I like the clear bottles because you can easily see exactly how much product you’ve got left and can stock up before running out. I also like the size of this bottle, it’s the perfect size for travel if you’re going on an extended holiday. Additionally, this micellar water has a drip feed attachment making it much easier to control how much product is used – a must have in my opinion! This micellar water has a subtle smell but I don’t find it intrusive and in actual fact it isn’t described as fragrance free so one must expect that there may be a smell. The cleanser itself has a water-like consistency as expected, I need 5-6 large cotton wool pads covered in product to remove my full face of make up and I’ve used over half of the bottle in 7 days. Considering it’s only 150ml of product it isn’t poor value for money and is more economical than the Boots Time Delay Daily Cleansing Micellar Cleansing Water. I think the full bottle would last me about 2 weeks. The B. Pure Micellar Water works well to remove make up, it struggles a little with eye make up but with an extra cotton wool pad covered in product it can remove it all. I also find this cleanser to be very refreshing which I like and I think that’s down to the cucumber juice extract. The B. Pure Micellar Water isn’t suitable for direct contact with eyes. It’s fine for the eye area and removing eye make up but if you do get this cleanser in your eye it stings quite badly. If I were to use this micellar cleanser long term I think I would get through so many bottles because it only contains 150ml of product (whereas I’m used to the Garnier Micellar Cleansing Water which contains 400ml of product) which could get expensive unless it’s purchased on offer. However, this is the perfect size bottle for a 2 week holiday. The B. Pure Micellar Water removes make up successfully, it has a drip feed attachment making it easier to control the amount of product used and it’s beautifully refreshing thanks to the cucumber extract. My skin also seems to agree with the formula of this cleanser. However, the formula isn’t suitable for direct contact with eyes so you do have to be very careful when using this cleanser which isn’t ideal. I personally would use this cleanser for a 2 week holiday rather than long term as it’s not as cost affective as the Garnier Micellar Cleansing Water. Have you used the B. Pure Micellar Water? What were your thoughts? Other reviews in the series: Boots Botanics All Bright Micellar 3 in 1 Cleansing Solution | Boots Time Delay Daily Cleansing Micellar Cleansing Water. Stop by next week for the fourth review in My Micellar Water Test, the Dirty Works Triple Action Micellar Cleansing Water.